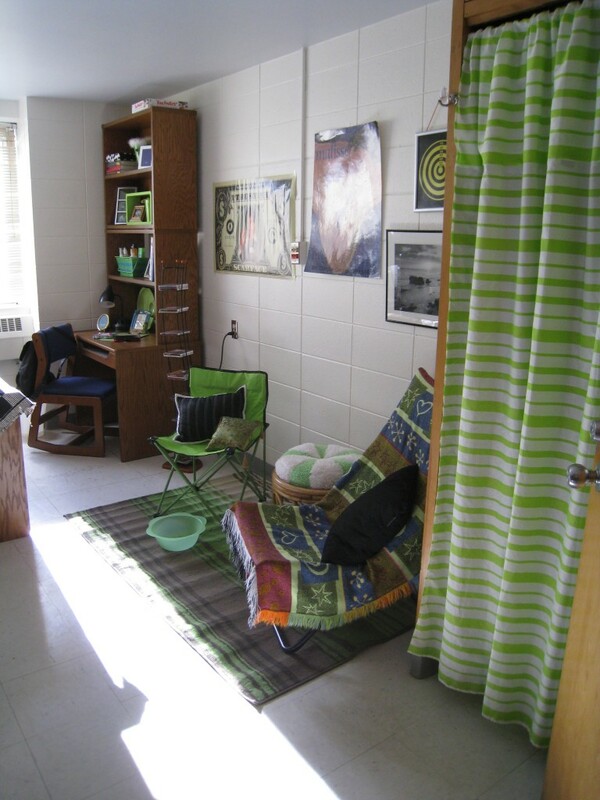 Guys can have a great looking dorm room without breaking the budget too. 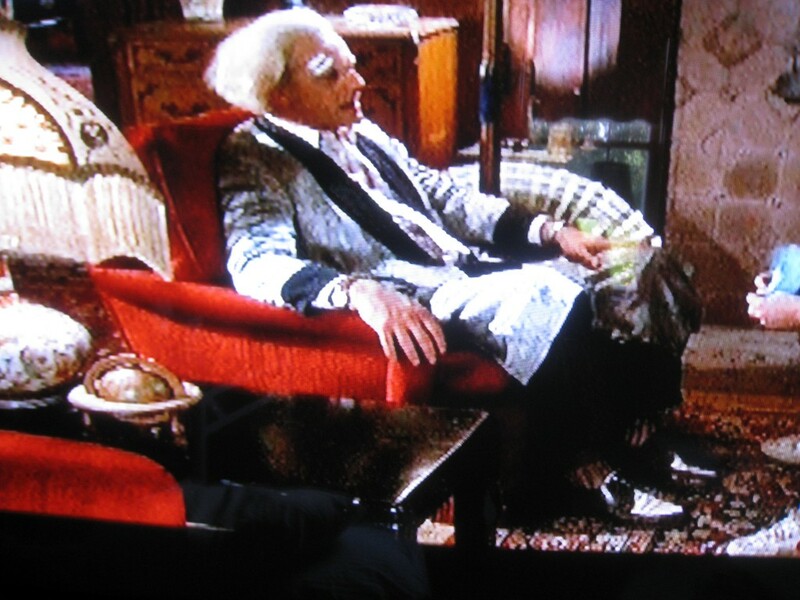 I know most guys aren’t as interested in what their rooms looks like as long as they have a bed, computer and TV. Since you’re living in this small space for 9 months, it might as well look good and reflect your personality! 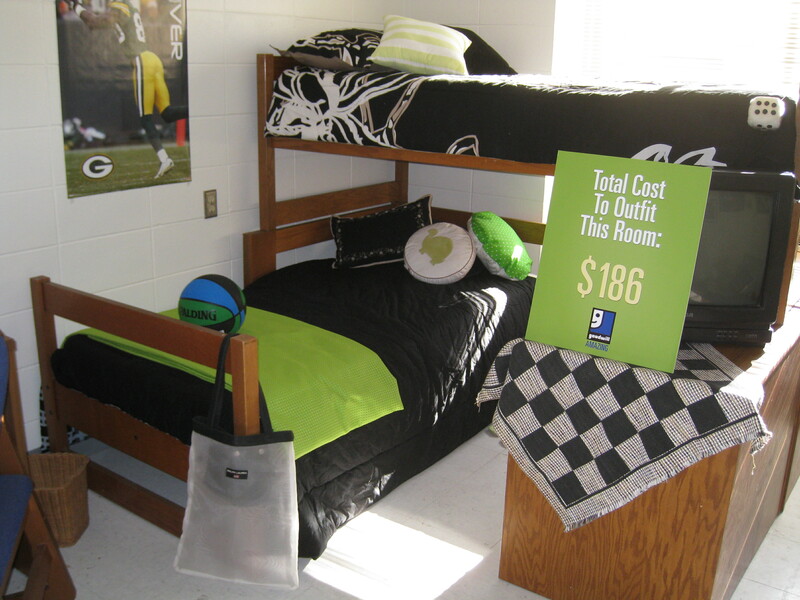 A black and green color combo is a vibrant and masculine alternative to decorating with school colors. I borrowed a room at Carroll University in Waukesha, Wisconsin to give guys some ideas. Create a great Man Cave with color! 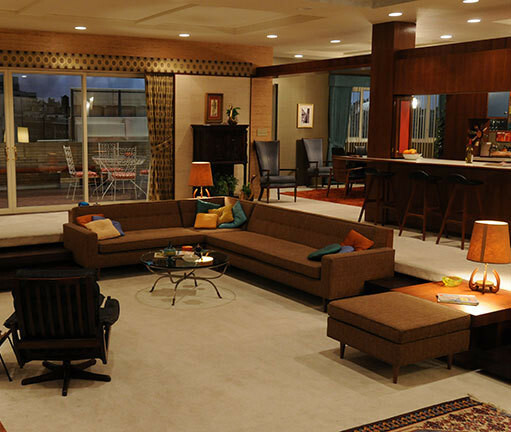 Depending on how you arrange the furniture, you can actually make the room look bigger than it really is. 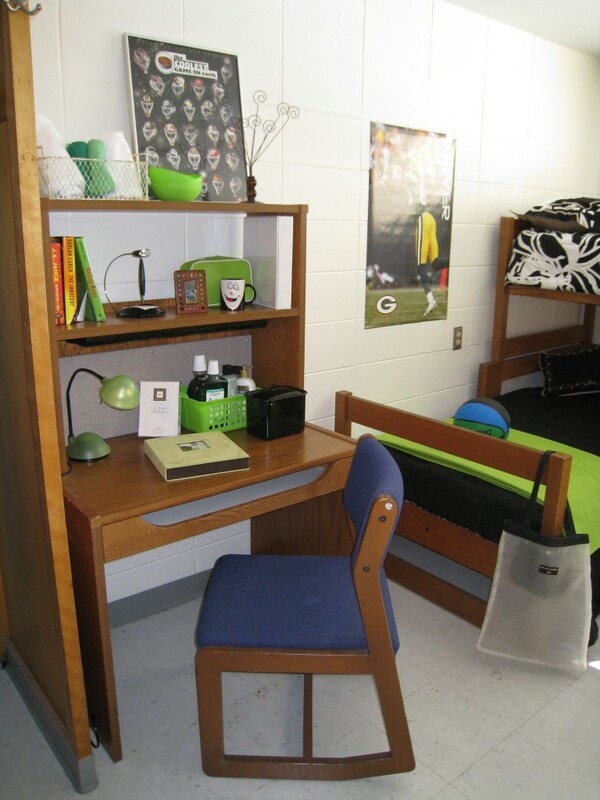 Almost all dorm rooms allow you to loft or bunk your beds. Once you do that, you free up valuable floor space. The bedding doesn’t match, but each is black with various green throw pillows. You’ll need lots of pillows for late night studying in bed. I did this whole room for only $186! 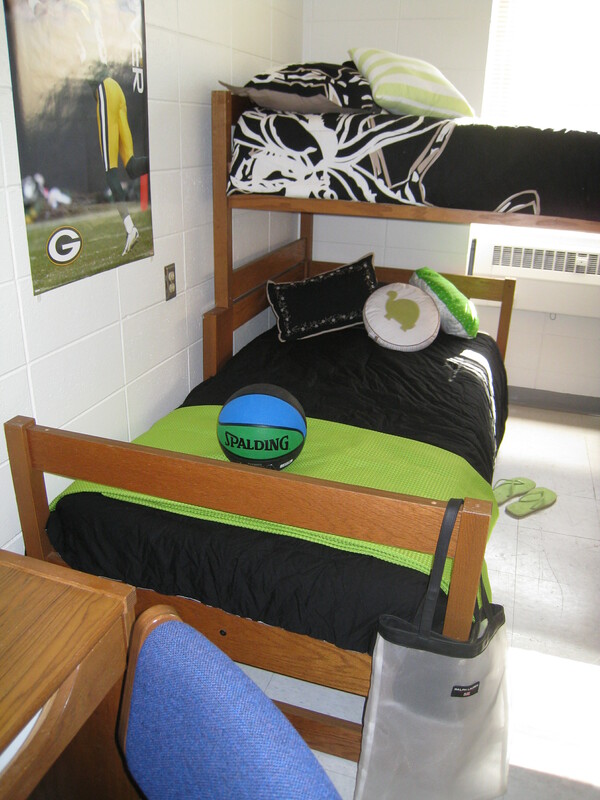 I lofted the second bed and positioned it perpendicular to the lower bunk. One of the dressers holds the TV. 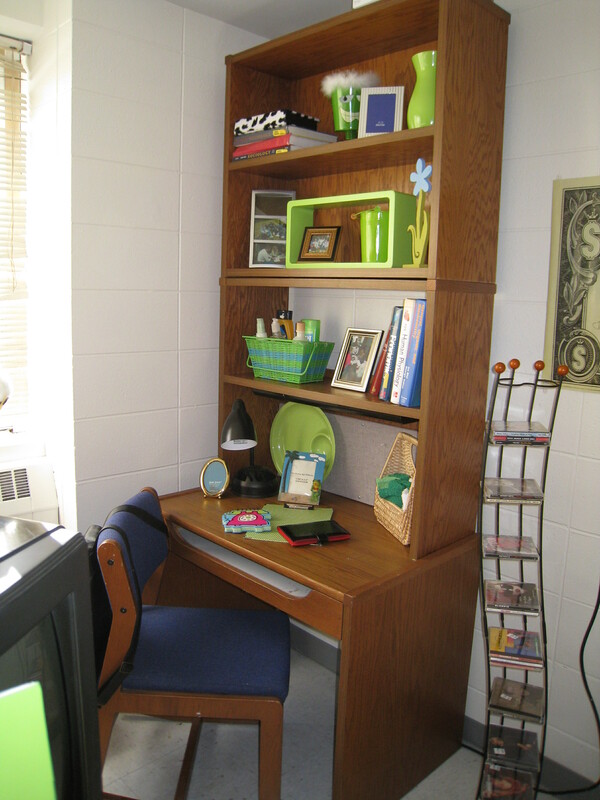 Design Tip: Put your TV on a swivel stand so you can view it from the beds, chairs and desks in the room. 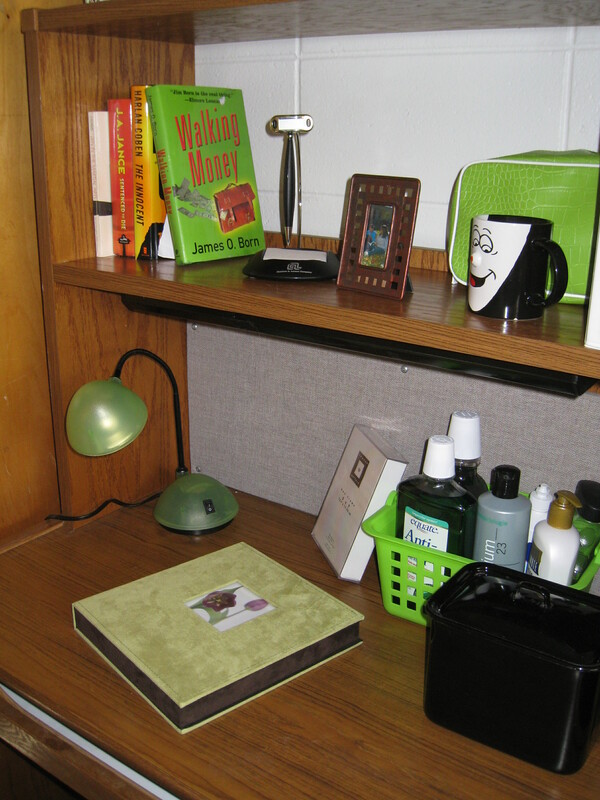 used green accessories to continue the color scheme. Stacking pieces of furniture also frees up valuable floor space. Separate the desks as far a possible. 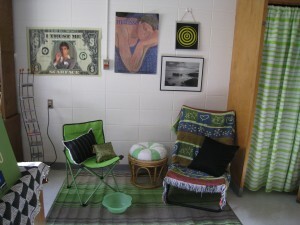 Each student will have some privacy for studying and feel like they have their own space. I stacked the extra bookcase on top of the desk hutch for more storage. 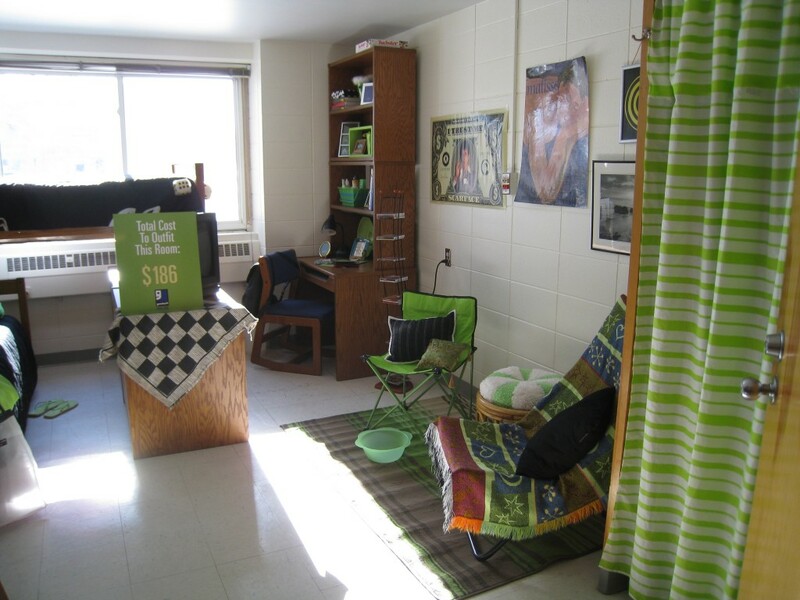 Every dorm room needs additional seating for relaxing and having friends over. Since the beds are in one corner, I had room to create a sitting area. The striped rug defines the space. A couple of fold-up chairs provide additional seating. Design Tip: If you find a chair that’s in less than perfect condition or the wrong color, throw a blanket or towel over it to disguise any imperfections. If your closet doesn't have a door, make your own. This dorm room doesn’t have doors on the closets, so in order to hide any future mess I hung a shower curtain on a tension rod. Design Tip: If you don’t sew, use duct tape to make a rod pocket at the top! This whole room was designed with items from Goodwill for only $186.00! At that price, you can change the look of your room every year!